A pamphlet-length book: fourteen poems (none longer than a single page), each poem facing a scraperboard illustration by Bill Sanderson. (The cover illustration on the right gives an idea of the lively style of Sanderson’s work.) I’ve read longer pamphlets, but Feast of Fools has the appearance and heft of a proper book; the pages are glued and the cover is satisfyingly substantial enough to allow for a lettered spine. Is there a word for this format? ‘Booklet’ sells it short, while ‘collection’ implies a greater range and length. The back cover uses ‘sequence’, though, for me, that doesn’t do justice to the balance between poems and art-work. But ‘sequence’ it will have to be. Stuart Henson has published four previous full-length collections (the first in 1985) as well as an earlier ‘sequence’ including art-work, Clair de Lune, with the artist Mark Bennett (Shoestring, 1998). His focus in Feast of Fools is the rich world of medieval misericords (those shelf-like perches, no more comfortable than a modern bus shelter, which allowed monks to rest unobtrusively during long services) and the frequently irreverent images carved on them. 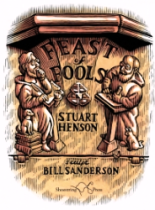 Just as each poem is inspired by a carving, Sanderson’s vigorous illustrations respond to an idea in the poem; these aren’t historical descriptions (or illustrations) but a way of fusing the medieval with the twenty-first century through what Henson in his introduction calls the hopes, fears and pretensions of humanity. I’ve tried to leave the illustrations out of this review but I can’t resist Sanderson’s Tutivillus, all big ears and eager eyes as he perches on the heads of two smart-phone-reading maidens. Scraperboard gives strong black/white images, similar to woodcuts, and these work well with the poems. They convey a shared relish for the medieval detail that can metamorphose so easily into our own preoccupations and vanities. Part of the pleasure of reading these short poems is that they have taken me back to Henson’s earlier work, to reconnect with why I have always liked his poems. When you have read Feast of Fools I recommend his other titles: he’s worth it.